When the LHG Sun Street research team got going in 2014, Frances Stenlake started looking through newspapers from the 1820s, when the Sun Street community began to develop, to see how the street featured in local news during the 19th century. She commented: “It was very exciting to discover how frequently its residents were involved, as victims or perpetrators, in various unlawful activities. These ranged from petty crime, harshly punished, to shocking scandal in which the villain went completely scot-free.”Several of the press reports suggested play scripts, and Sun Street researchers transformed themselves into ‘Sun Street Players’ to perform one of the stories, Stealing Turnip Greens, at the Dec 2014 LHG meeting. This went down so well that the next step was to go round the corner to the Little Theatre to see whether its experienced thespians would be interested in presenting more of the stories. They certainly were, and Joyce Fisher is now directing a reading of The Darker Shades of Sun Street, taking part herself with Jennifer Henley, Miles Jenner and Mike Piller. Appropriate musical accompaniment will be provided by Valmai Goodyear of Lewes Folk Club.As usual the meeting will be at the King’s Church building, Brooks Road, and all will be welcome. We shall be serving coffee and biscuits prior to the meeting. 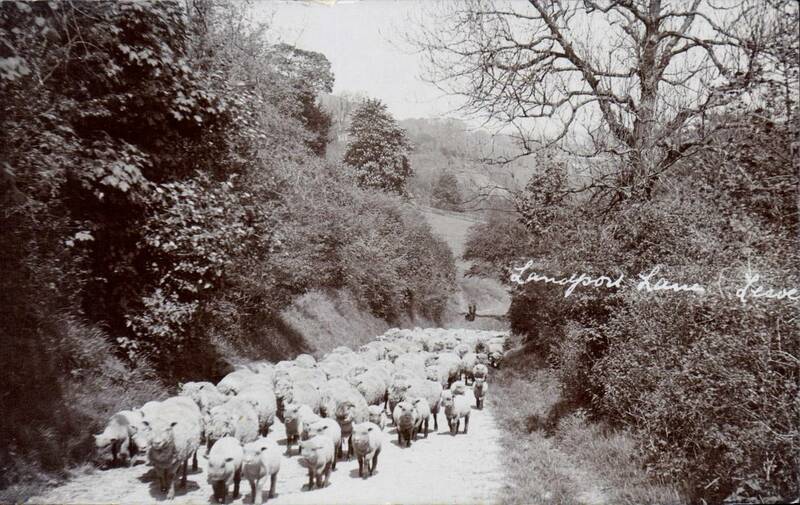 Two different copies of this James Cheetham postcard featuring the Landport Farm Southdown flock and their lambs making their way up from the farmstead to the Downs have been offered for sale on ebay this autumn. Taken little over a century ago, this is now very atmospheric. Shepherds and sheep figure prominently in Cheetham’s work. I rather doubt they would make it across the Offham Road today. 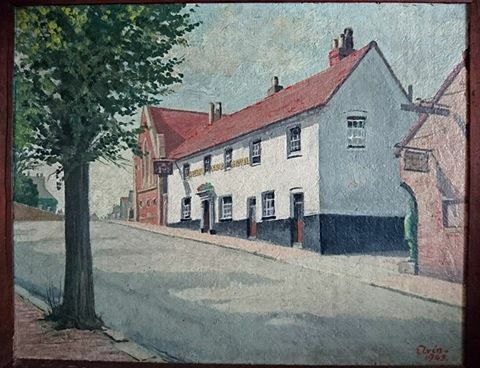 This image of a well-executed painting of the Pelham Arms, signed by ‘Elvin’ and dated 1949, was posted recently on the Lewes Past Facebook page by Steve George. This artist was also in Lewes in 1944, when he painted an image showing the wartime rations that were to last two people for a week. This painting also showed his ration card, made out for John R. Elvin, 40 The Avenue, Lewes. A 1951 local directory lists John R. Elvin at 40 The Avenue, Lewes. Do any memories of him survive? On Thursday 24 June 1841 the two Lewes constables received formal notice from the Sheriff of the county that they should elect two new burgesses to represent the borough in the new Parliament. The precept was read at County Hall by the town clerk, after which a proclamation of the election date of Monday 28 June was made by the town crier. They then went in procession through the borough, the Cliffe, South Malling and Southover, preceded by the Town Band. In Lewes Wynne Edwin Baxter (1844-1920) is perhaps best known as the last high constable of the old Lewes borough and in 1881 the first mayor of the new Borough of Lewes, in whose creation he was a prime mover. His portrait in his robes of office hangs in the town hall, and is reproduced in Bulletin no.19. His grandfather John Baxter (1781-1858) was the founder of the Lewes printers and publishers at 35 High Street. His father William Edwin Baxter (1808-1873) joined the family business and in 1837 became the founder and proprietor of the Sussex Agricultural Express – a Tory newspaper established in opposition to the Liberal Sussex Advertiser. Although Wynne Baxter retained an interest in the family printing and publishing business, he trained in the law, qualifying as a solicitor in 1867. He established a practice in Albion Street, Lewes (still remembered in the Sussex-wide firm Mayo Wynne Baxter), but also had a London home in Stoke Newington and a legal practice and an advertising agency in Cannon Street, London. He is best known as a coroner, initially in Sussex and then for a number of London and Middlesex districts, including the East End. Near the end of his life he calculated he had presided at 40,000 inquests, including those of the victims of Jack the Ripper, the Sidney Street anarchists and many Great War victims of German air raids. After his father’s death he added the role of chairman of W.E. Baxter & Son, but homes and businesses in town and city did not fully occupy him. He was active in public life in Lewes, Stoke Newington and London, serving as headborough of Lewes in 1868 and constable from 1878, while simultaneously under-sheriff of London and Middlesex and clerk to three city livery companies. For good measure he was considered one of England’s leading authorities on the poet John Milton, creating a unique library of over 3,000 volumes on the poet and his work, and giving lectures about him illustrated by lantern slides. He was fascinated by natural history, an expert on diatoms, treasurer of the Royal Microscopical Society and the translator of several scientific texts from French into English. He also maintained a country home in Stroud, Gloucestershire, presumably as somewhere to relax. He was a member of the Sussex, Surrey, Kent, Middlesex and Gloucestershire archaeological societies. He suffered his final heart attack after the third inquest of the day at Poplar Coroner’s Court. His funeral was held at St Mary’s, Stoke Newington, where he had been churchwarden for 25 years, and where he had married over 50 years earlier, and his body was laid to rest in the family vault in All Saints churchyard, Lewes. It is for his association with Jack the Ripper, about whom he had his own theories, that he is best remembered today. He has a Wikipedia entry, and a detailed biography by Adam Wood that was first published in issue no.61 of The Ripperologist (2005), is now available online, and is only briefly summarised in this article. The 26 October 1835 Sussex Advertiser reported that on the following evening the members of the Lewes Pic-Nic Society were to give their annual entertainment at the Theatre in aid of the funds of the popular East Sussex Hunt Races, which were to be held under the patronage of the master and subscribers of the East Sussex Hunt. The Pic-Nic Society was to perform the domestic drama of ‘The May Queen’, together with ‘The Unfinished Gentleman’ and other entertainments. These were to include a performance by Mr C. Kitchener on the ‘Grand Piano Forte’ of Carl Czerny’s brilliant variations of some Rossini music. The East Sussex Hunt was based at Rushey Green, Ringmer, but its races were to be held at Lewes racecourse. Those attending included the young Princess Victoria and her mother, who were staying with Lord Liverpool at Buxted Park. It is recorded that the princess made a speech to mark the occasion. In 1839 Henry Fitzroy, MP for Lewes, married Hannah Rothschild. They had two children, a son who died aged 16 in 1858 and a daughter. After Henry Fitzroy’s death in 1859 his widow Hannah, commissioned the Fitzroy Library in Lewes in his memory, before she also died in December 1864 aged 49. The library remained there until 1958, when it was moved to Albion Street. After a period of dereliction the building was rescued and converted to a private house by surveyor Jim Franks. However, Hannah Fitzroy’s original intention for a Lewes memorial to her husband had been the provision of public baths, and a committee chaired by the Quaker businessman Burwood Godlee was established to implement this. A conversation on a train, followed by visits to operational examples led to Burwood Godlee becoming convinced that what Lewes needed was not a ‘water trough’ one of the new Turkish baths then becoming fashionable. On this occasion he failed to convince his fellow townsmen, whose preferences were for an expensive open air swimming bath, provided on the Town Brook in 1860 by public subscription. In the end Hannah Fitzroy and her architect, Sir George Gilbert Scott, determined that the library would be more appropriate. However, Burwood Godlee was not a man to be dissuaded from what he saw as the right path. He built himself a private Turkish bath at his home, Leighside, which he used to convince doubters. Then he and a handful of other subscribers founded the Lewes Bath Association Ltd in 1861, and in 1862 they took a 99 year lease from the Society of Friends of a plot of land in Friars Walk on which they constructed a ‘Hot Air and Hot and Cold Water Baths’. The building, designed by a local architect, Mr Parsons, and built by Lewes builder J. Davey, opened in June 1862 and included accommodation for the attendants, Mr and Mrs Henry Norman. It proved popular with both men and women, and in its first 12 weeks there were more than 1,500 bathers. The Turkish baths maintained a steady custom over the next decade, though receipts showed a slow but steady decline over the years, especially after a much larger rival baths were opened in Brighton in 1868. In 1882, the year of Burwood Godlee’s death, the Lewes Baths Association was wound up and a liquidator appointed. There followed a long negotiation with the new Borough Council about whether it would or would not purchase the premises. In recent years the building has housed a council printing service, but that has been moved to Eastbourne so the building is again in need of a new role. Source: Lewes: 35 Friars’ Walk. In: Malcolm Shifrin, The Victorian Turkish Bath website. This entry was posted in Art & Architectural History, Biographical Literature, Cultural History, Ecclesiastical History, Lewes, Local History, Political History. Bookmark the permalink.